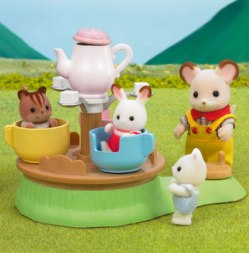 The Baby Teacups are one of the favourite attractions at the Sylvanian Baby Fairground! Turn the handle to watch the babies whirl around inside the tea cups. The teapot also spins and lifts its lid.